"My SAFG teachers were the best teachers I've ever had." "If you make mistakes, that is okay. Just keep trying. That's how you learn." "I love being with my friends." "I talked to my parents about all the projects I did." "I feel frustrated when I do something hard. But Teacher Sara and Teacher Taylor say that's just part of science." "I like doing projects that help people." Engaging children in science, technology, engineering and math (STEM) is not exclusively about the content and learning facts and procedures. It is important to start STEM education early, but the approach is just as important. SAFG strives to create a comfortable, inviting environment complete with nurturing teachers and a engaging classroom set-up. SAFG aims to provide opportunities to practice asking questions, collaboration, persistence, assertiveness and risk-taking -- all gateway skills and attitudes to have when engaging positively in STEM. Research and experiences suggest that without these important pieces, children, especially girls, are more likely to lose interest in science and math in school - as early as first grade! We know that there is gender and minority gap in STEM fields. We know that part of the solution is incorporating STEM in early childhood education, but we must understand how kids learn best and set up the learning stage for positive experiences. Having a content expert facilitating class is important, but just as critical is a teacher who can address the life skills and attitudes that complement STEM learning, attitudes that help spark and sustain the interest in STEM. SAFG is grateful for its amazing teachers and the support of the community to carry this approach out, and it has been a joy to see our girls grow and flourish! SAFG just finished seven, 8-week sessions at five schools this spring which culminated in a festive, end-of-year party to celebrate all of our girls from all schools, our teachers, volunteers, administrators, donors and supporters. Over 200 people attended the SAFG party at the Emeryville Center for Community Life (thank you to everyone at ECCL, including John Rubio and Barry LaBass!) SAFG was honored to receive a certificate from Congresswoman Barbara Lee in support of our work in the East Bay at the event - thank you to Josh Quigley for attending. At the party, girls and their families and our SAFG supporters had fun building and creating a variety of fun, hands-on STEM projects. There was food, a raffle and SAFG t-shirts for all the girls to celebrate an end to a great year. Reflecting over the last year, SAFG has grown a lot! We are proud to announce that, since its inception in 2014, SAFG has served over 725 (non-unique) girls through our afterschool programs (meaning many take our classes more than one time). SAFG’s student retention rate year-over-year is 70%. SAFG also finished a strong school year offering 18 STEM library drop-in sessions at 81st Ave., Eastmont and Golden Gate Libraries in Oakland for girls and boys – doing projects like learning the chemistry behind “Making Ice Cream”, the physics of “Catapults” and circuitry by playing with conductive dough. SAFG also held special STEM classes at four additional libraries in March to celebrate Women's History Month. Thank you again to our great role models for volunteering their time. SAFG served over 450 girls and boys through our school-year STEM Library program! SAFG just finished up two great weeks of summer camp, “Product Design Using Coding, Craft and Engineering.” Thank you to Code for Fun for providing the curriculum and teacher training! Girls in K-5th were given different design challenges. The 3-5th grade girls designed projects and then converted them to a digital project using code (Scratch). The K-2 girls designed and engineered projects using craft. Thank you OBAR for supporting our summer camp! We want to send a special thank you out to the team from Desmos for volunteering during the first week of summer camp every day, sharing their knowledge of product design and coding - huge thanks! Also a thank you out to Iman, a high school student in Oakland, who volunteered as a great role model in our camp and to the many STEM role models who visited the girls over the two weeks to inspire them with what they do and show them that STEM is a field they can see themselves in: Kris Klotzbach and Brittany Pahon (Clif Bar); Eri Takahashi (Mookuu); Anna Lee (Lioness); Ambika Bumb and Min Wang (Bikanta); and Lynne Sneed (QuanticMind). SAFG is two weeks into its expanded STEM Library Program, in collaboration with the Lawrence Hall of Science, at seven Oakland libraries (81st, Eastmont, Rockridge, Elmhurst, Golden Gate, Main and Brookfield libraries). Every week this summer there are at least 1-2 free STEM classes being held (see our website for all locations and times) at one of the above libraries. Our goal is to reach over 500 girls and boys this summer, especially many who have never taken an after-school STEM class in the great library setting! SAFG hopes to spark and sustain that joy of discovery in these budding scientists. Thank you again to NXP Semiconductors for supporting this program and engaging kids in STEM! 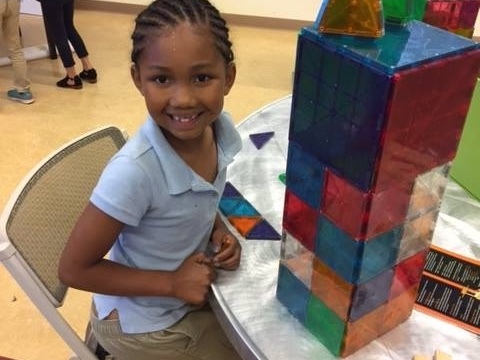 Finally, thanks to the wonderful generosity of the Nancy P. and Richard K. Robbins Family Foundation, SAFG is offering 60, one hour STEM classes to all of the girls and boys at the Emeryville Recreation Center. The classes will serve approximately 150 children over the summer offering them each 10 STEM classes each, with fun themes such as Physics (catapults, parachute science), Chemistry (bubble science and canister rockets), Math (musical Instruments, measure me mobiles), Engineering (design a tool, earthquake-safe towers) and finally Botany, with a week outdoors in the edible garden. SAFG is very pleased to announce it received a grant from the Cisco Foundation in June! SAFG also received, for a second year, a grant from American Eagle Outfitters Foundation. SAFG was awarded a small grant from the Ross Stores Foundation and the Oakland Berkeley Association of Realtors (OBAR) awarded SAFG a grant to provide scholarships for our two-week summer camp (see more above). Finally, the Nancy P. and Richard K. Robbins Family Foundation generously provided SAFG with a donation to offer 60 classes over a 5-week period at the Emeryville Recreation Summer Camp to its 150 girls and boys. We are very honored to know that these companies value the work SAFG is doing and so thankful they are supporting the children in our community to be our future scientists! We want to thank them all for their great support. Also very exciting this spring, SAFG raised over $7,000 during the East Bay Gives drive on May 4th – we want to thank all of our superstar individual donors for their ongoing support. If your company provides small grants to STEM programs, we would love to apply. We would also love to come speak to your company at a brown bag lunch to gain support for our mission. Please contact Courtenay at ccarr@scientificadventures.org. MAKE YOUR OWN FIDGET SPINNER! 1. Choose which template you would like to make and cut it out. 2. Trace the template onto your cardboard and cut it out. 3. Decorate your spinner with markers, pens, etc. 4. Take 3 pennies and glue one coin onto each corner and let it dry. 5. Locate the center of yo ur fidget spinner and make a hole with a pin. Make the hole bigger until your toothpick fits. 6. Test the spin and adjust the size of the hole until it spins without getting stuck. 7. Cut 2 - 4 cardboard discs that will fit in the middle of the fidget spinners. 8. With a pin, make a small hole in the disc so toothpick fits in tightly. 9. Glue the first disc to the end of your toothpick. 10. Insert the toothpick into your fidget spinner. Take the second disc and slide down the other side of the toothpick and glue in place. Cut off any toothpick sticking out.